I read this article and found it very interesting, thought it might be something for you. The article is called IndiaSpend Budget Primer – V: Bridging The Rural-Rural Divide and is located at https://archive.indiaspend.com/sectors/indiaspend-budget-primer-v-bridging-the-rural-rural-divide. In 1901, approximately 89% of India’s population was living in rural areas… by 2011, that number had come down, but only to 69%. Although the rural population has been declining, more than half of India’s population still lives in villages. But contrary to popular belief, the major source of income for the rural population is industry and services rather than agriculture. While the income disparities between urban and rural India have been narrowing, the disparity within rural India is increasing. Keeping these realities in mind, the Government has launched five key rural development programmes that focus on different areas like roads, employment generation, electrification, affordable housing and clean drinking water. The Government spent nearly Rs. 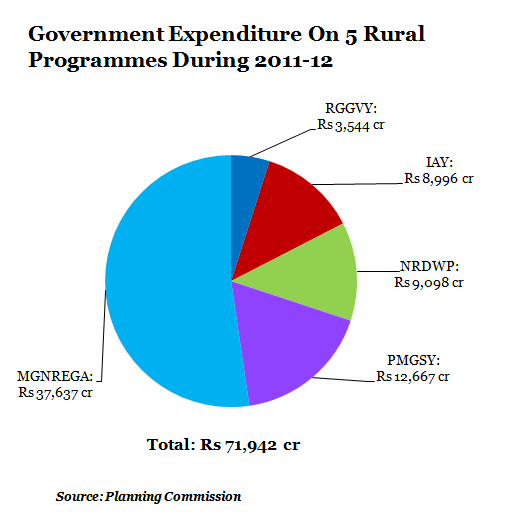 71,942 crore on the five programmes in 2011-12. Pradhan Mantri Gram Sadak Yojana: PMGSY was the flagship programme of the BJP-led National Democratic Alliance (NDA) and was launched in December 2000.It aims to ensure connectivity of habitations with a population of more than 500 people in the plains and more than 250 in hilly and deserts areas with all-weather roads. India has 600,000 villages, PMGSY’s targeting to connect 159,000 villages. The government has spent over Rs 1,25,000 crore ($25 billion) for building rural roads over the last 12 years.After touching a high of Rs 18,833 crore in 2009-10, the allocation for the programme has declined (32%) to Rs 12,667 crore in 2011-12. Mahatma Gandhi National Rural Employment Guarantee Act: MNREGA, the flagship programme of the UPA Government, was launched under the Ministry of Rural Development in February 2006. The scheme provides daily wages at an average of Rs 100 per day upto 100 days in a year. The government has so far allocated Rs 1,58,029 crore for the scheme.The highest expenditure was seen in 2010-11 at Rs 39,377 crore. Rajiv Gandhi Vidyutikaran Yojana: RGGVY, under the Ministry of Power, was launched in April 2005 to provide rural electrification infrastructure.The programme aims to provide electricity to 125,000 uncovered villages as well as connections to 23 million rural households.A total of Rs 22,988 crore has been spent since 2007-08 till 2011-12. 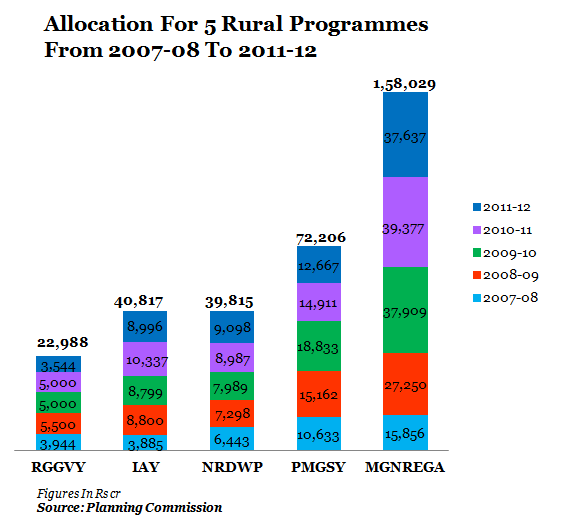 The highest increase was 39% during 2007-08 (from Rs 3,944 crore) to 2008-09 (Rs 5,500 crore). There has been a decline (-35%) in spending on the project from Rs 5,500 crore in 2008-09 to Rs 3,544 crore in 2011-12 . Indira Awas Yojana: IAY was launched in May 1985 under the Ministry of Rural Development, and helps rural poor people with construction of dwelling units and upgradation of existing houses. The government has spent Rs 40,817 crore from 2007-08 to 2011-12.The allocation for IAY increased from Rs 3, 885 crore in 2007-08 to Rs 10,337 crore in 2010-11 but has declined to Rs 8,996 crore in 2011-12. National Rural Drinking Water Programme: NRWDP was launched in 1972-73 under the Ministry of Drinking Water and Sanitation as the Accelerated Rural Water Supply program but was revised in 2009.The government has spent Rs 39,815 crore since 2007-08 to 2011-12.There has been a 41% increase in expenditure from 2007-08 to 2011-12. Many programmes are not being implemented properly due to capacity issues like lack of skilled labour and proper equipment, poor operations and inadequate management systems. The programmes dealing with poor and disadvantaged groups have been facing problems due to backlogs of beneficiaries and lack of awareness among the beneficiaries. In addition, there have been delays in payments to beneficiaries under schemes like MGNREGA. 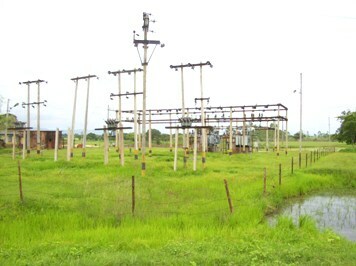 Other factors like land availability, high capital costs and delays for sanctioning projectsare major concerns for programmes like NRDWP and PMGSY. So, even though the governments have been concentrating on rural development, it needs to realise the realities of rural India and formulate policies according to them.